Antibiotics are used to prevent the growth of bacteria. 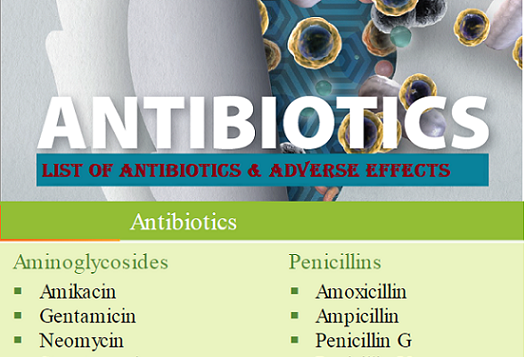 Antibiotics Include medication classifications of aminoglycosides, cephalosporins, fluoroquinolones, macrolides, lincosamides, monobactams, penicillins and penicillinase-resistant penicillins, sulfonamides, tetracyclines, antimycobacterials, and others. The first antibiotic, penicillin, which was first discovered and reported in 1929 by Alexander Fleming was later found to be among several other antibiotic compounds called the penicillins. (McGeer et al., 2001). Penicillins produced by certain bacterial strains as well as facilitating the movement of antibiotics across the outer membrane of such bacterial cell walls. This double-pronged capability increases their spectrum of activity against Gram-negative bacteria. In particular, some penicillins such as Augmentin are produced in combination with non-antibiotic compound that are able to inhibit the activity of bacterial penicillinase enzyme. Augmentin is actually a drug comprising amoxicillin (antibiotic) and clavulanic acid a non-antibiotic compound. Clavulanic acid is able to inhibit beta-lactamase enzyme thereby prolonging the antibacterial activity of the amoxicillin component of Augmentin even amongst penicillinase producing bacteria.